Chicken wings have to be one of my favorite snacks! Well, right behind chips and fresh salsa 😉 This chicken wing dry rub is a great way to vary your normal wing routine of sauces/dips. Frankly, is doesn’t even have to be for just wings! We’ve used this on chicken breasts also! If you want something to dip these in check out my dry ranch seasoning mix here! I’m always happy to hear if you made this and what you thought of it – leave me a comment below! Place half of the wings and half of the seasoning mix into a large Ziplock bag, close and shake well; repeat with the other half of the wings and seasoning. Place on a baking sheet and bake according to the instructions on your chicken wing bag (ours state 45-55 minutes at 400F). 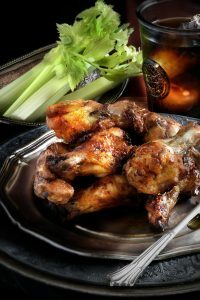 Chicken should be cooked to an internal temperature of 165F - but if you're testing wings this can be a little tricky, as they are thin and if you touch the bone with the thermometer it will impact the reading.